'Regionaly' will never again achieve the hegemony attained in 2006, and painful transformations await the party. Their strategic plan to achieve total power in the country by assembling a constitutional majority in the VR fell through, and drove Yushchenko to call for new elections. Even if a PoR-NUNS coalition is eventually formed, this will be a serious loss of face for PoR because they will have to make concessions to their junior partner, NUNS, e.g. on the Russian language issue and on NATO. The President will never give back the PM's job to 'Regionaly', nor the posts of ministers of Finances or Justice, nor control over the energy sphere. Yushchenko has tightened his grip on the 'sylovyky' structures and will not share these with PoR. Only the economic and social- humanitarian ministries would be distributed amongst PoR. However a wide coalition would have some advantages for PoR - retention at least some power would safeguard the party from division and would give them breathing space to consider a strategy for the 2009 presidential elections. Most of the groups in PoR positively support the creation of a wide coalition. Only Viktor Yanukovych and his circle would be dissatisfied with the formation of a wide coalition because it would leave him without a clear role in the party. It would be difficult for him to be appointed VR speaker or PoR fraction leader. Yanukovych's future career prospects would probably be best enhanced by a spell as shadow premier - he would remain a highly prominent political figure up to the next Presidential election campaign in late 2009. But the possibility of PoR being an active party of opposition would not entirely suit Rinat Akhmetov, Ukraine's richest oligarch and PoR sponsor. It was Akmetov that compromised with Yushchenko in the spring by agreeing to early re-elections. If PoR have to go into opposition Akhmetov will maintain a policy of soft interrelations with the government authorities. At the moment a temporary internal truce exists within PoR's top echelons, as indicated by the composition of their working group preparing the first session of the new VR. It comprises representatives from each wing of party: Yanukovych himself, Raisa Bohatyryova, Mykola Aazarov, Andriy Klyuev [who apparently has cordial ties to Yuriy Lutsenko], Volodymyr Rybak, and Serhiy Levochkin. The benefits of the wide coalition for the majority of the members of party are obvious but whatever the status of PoR turns out to be, their informal leader Akhmetov will want to get rid of Yanukovych who will have to take the blame for losing the elections. However, there are two big problems - first there is no clear replacement for Viktor Fedorovich, who remains very popular with his electorate and with a substantial part of the party's members. If the Party of Regions nevertheless join some kind of democratic alliance and Yanukovych is replaced, it is unlikely he would want to walk off the political stage volutarily. He could split the party and create his own political force in order to fill the niche of leader of the formal opposition. The non Donetskiite 'Regionaly' in particular will strive for closer co-operation with the orange authorities, something which is already happening, e.g. in Odessa and in Luhansk. Withdrawal to opposition and the "opportunistic" position Of Rinat Akhmetov could return PoR to their roots, i.e. make it an exclusively regional project, as in 2002. These elections seem to indicate that "Regionaly" have passed the peak of electoral success and are now beginnig to slowly lose votes. Yushchenko postpones any referendum on Ukraine's NATO membership for many years into the future. "As regards formal membership or non-membership, this is a question that will be put to the nation, and the nation will give its consent, but this will happen not in the next year or two, but after many years, when Ukraine will have matured properly for such an answer to such a question," said Yushchenko to journalists after laying flowers at the Tomb of the Unknown Soldier in Kyiv to mark the 63rd anniversary of Ukraine's liberation from Nazis. At last some common sense from the president. "Atlantic Council Task Force..found that across the political spectrum, Ukraine’s political elite agrees, with few exceptions, that corruption has become a threat to the country’s democratic future and economic prosperity. Following the Orange Revolution, the Ukrainian government, as well as foreign governments and NGOs, began to address this issue through a range of legislative and administrative initiatives, including ratifying several international conventions against corruption, establishing governmental working groups, and cooperating with international advisory groups. It is the judgment of the Task Force that the vast majority of these anti-corruption efforts have proven ineffective. Ukraine’s extended political stalemate, a corrupt judicial system, and a failure in political leadership on all sides have allowed a widespread “culture of corruption” in Ukraine to persist. This has been exacerbated by a rise in international organized crime, which, paired with corruption in all branches of power, has the potential to make the Ukrainian government vulnerable to foreign political and economic influences, potentially endangering Ukraine’s national security." "It is the conclusion of the Atlantic Council Task Force that nothing is more important to Ukraine’s long term economic and political health than combating corruption." Today former Nasha Ukraina 'big beast' Petro Poroshenko was interviewed on Radio Svoboda, by his former Channel 5 employee Roman Skrypin. Some of the exchanges are interesting.. Question - Do you consider, Petro Oleksiyovych, that something or someone could prevent Yuliya Volodymyrivna becoming Premier? Answer - I believe that today the coalition [is endangered by] a huge number of threats. When talking of its likelyhood, I would say 50-50. I would not get carried away by illusory hopes that everything will turn out well. This does not mean that I wish this, though. But it does mean, that I am very lucky that today the responsibility for creating or not creating the coalition is carried by politicians [and not by me]. In the interview he claims that since the elections he has had 8 or 10 meetings with Tymoshenko, at her request, and praises her for conducting her campaign in a brilliant manner. He also claims that he was asked both by Tymoshenko and by Yanukovych to serve in their cabinets. Poroshenko, one of the infamous 'lyubi druzhi' was a member of Yushchenko's inner circle during the orange revolution. His constant squabbling with Tymoshenko, when she was PM and he was head of the National Security and Defence Council after the orange revolution, caused Yushchenko to sack Poroshenko and the entire Tymoshenko cabinet. He was not on the NUNS election list, so will not be entering the newly elected VR. He is currently head of the National Bank of Ukraine council, which is, according to the constitution, a non political position. Oh, this is the 1000th posting on F.N. Yuriy Yekhanurov is rocking the boat again today, as is Ivan Plyushch who has refused to sign the latest BYuT-NUNS agreement. As usual, during the elections it was BYuT, this time assisted by young 'radicals' such as Lytsenko and Kyrylenko from NUNS, that did the 'heavy lifting' while Yekhanurov and their ilk skulked in the background. Now the elections are over, true to form, out they crawl..
Former PM and now NUNS deputy Yuriy Yekhanurov has called upon the BYuT-NUNS coalition to begin negotiations with PoR and the Lytvyn bloc. "If we lock ourselves only in our political forces and do hear our [other] parliamentary colleagues, then, in actual fact, the election will not have brought any results, and the division of the country continues. We have to hear one other," said Yekhanurov. He also warned that he will leave Our Ukraine if his proposals on the coalition with BYuT and the creation of a coalition are not listened to at tomorrow's session of the party presidium. Earlier Yekhanurov stated, that it is not entirely understandable, why the leaders of NUNS "began to crawl before Yulia Volodymyrivna" without fully agreeing of positions between the two blocs. Yekhanurov replaced Tymoshenko when she was sacked by Yushchenko in September 2005, but Tymshenko 'put the boot in' by supporting a no confidence vote in January 2006 during that winter's gas crisis. *To go pear-shaped - to go wrong, to fall apart, to get out of control or to fail. Primarily a British expression. Origin uncertain - possibly Royal Air Force acrobatic pilots describing malformed 'looping the loop' trails. Or, unkind description of aging process of humans. An article in 'Gazeta po Kiyevski' says that, unsurprisingly, PoR are doing all they can to drive wedges between BYuT and NUNS and ensure their frail democratic coalition never gets off the launch pad. They say the nomination of Vyacheslav Kirilenko, Nasha Ukraina's #1 and NUNS#2, as speaker of the VR is particularly vulnerable to attack. Some of NU's older hands consider the 39-year old Kirilenko too young and just too pally- pally to Tymoshenko. Kirilenko has little experience of business and is not closely linked to any financial or industrial group - they don't like him in the president's secretariat. They would prefer someone more immersed in the shadier side of Ukrainian politics, someone who would be more acceptable to PoR. Veteran former VR speaker Ivan Plyushch may fit the bill: he favours a grand coalition, and would make its creation more likely in the new VR. It would only be a matter of 'convincing' several orange deputies using the usual methods; and PoR would throw their weight behind Plyushch if BYuT got stroppy. As others have noted, many of Ukraine's leaders have skeletons in their cupboards, and kompromat on one another. They have developed their own kind of modus vivendi. Kirilenko is just 'too nice a chap' to be trusted .. and the voting in the VR to elect a speaker is by secret ballot.. Looking forward, in the long run Tymoshenko is, in some ways, in a win-win situation. Since last March's elections she has gained 1.5 million extra voters. If a BYuT-NUNS coalition were to fail to be formed and a broad PoR-NUNS coalition came into being, Yushchenko's popularity would decline even further. Because the latest elections have yet again shown Ukraine to have a slight inbuilt orange majority, by the time the next presidential elections come around [in January 2010] , or any further extraordinary VR elections take place, she and her party would be confident of outright victory. But if during this time the PoR-NUNS coalition were to clean up their act, reduce corruption and deliver the goods to the electorate...Isn't this what democracy is about? p.s. Rumour has it Yanukovych has gone off for a few days to the seaside, maybe jealous that Yushchenko and Tymoshenko are living it up and rubbing shoulders EU leaders in Lisbon. Or maybe he is not talking with Akhmetov right now while Rinat's people are wearing out the carpet in the pres's secretariat..
A possible solution of the the sticky problem of forming a workable coalition in the VR could lie in sub-divisions of the main political parties somehow co-operating on important matters of state. Today Ukrainian society strongly associates the president and the premier with particular political colours. Ukrainians of all colours perceive a broad coalition as a betrayal of interests of both the orange and white-and-blue camps. So, the formation of a coalition of factions of different political camps could break this stereotype and safeguard Ukraine from any major tremors in society. A fight is progressing for a 'gold share' for Yulia Tymoshenko and Viktor Yushchenko between Rinat Akhmetov's wing and Viktor Yanukovych's wing of Party of Regions. A source in the pres's secretariat told E-Izvestiya: "Yushchenko absolutely consciously relates to the fact that 228 votes is too few for an effective coalition". The source said that, in the opinion of the President, for the solution of the major problems e.g. the new constitution, regulating relations between the branches of goverment, between government and opposition, the imperative mandate, the cancellation of the parliamentary immunity and privileges etc. it is not absolutely necessary to have a formal coalition. "In this situation Yushchenko is counting on the support of the moderate wing of PoR, particularly in the person or Rinat Akhmetov and his team. But negotiations between them are not all smooth - Akhmetov has stringent demands. The one thing that unites them is their striving for stability at different levels of authority," emphasized the source. "The President is attempting to create such conditions in the rada that even with a limited coalition, legislative work can be accomplished in a normal stable manner." Two days ago premier Viktor Yanukovych stated that in the new rada it would not possible to create the one-color coalition: "We will make efforts in order to unite Ukraine so that the people can live in stable conditions, and the authorities can work effectively". Another source in the secretariat, said, "The question remains open: does Yanukovych oppose the moderate wing of PoR or not? In this respect Yanukovych it fighting for his place in PoR. But the President is thus far distrustful and is suspiciously disposed to the present premier." According to the source, Yushchenko is also looking for votes, particularly on key issues, amongst deputies in Lytvyn's bloc: "The ex-speaker [Lytvyn] does not want formally to enter into any coalition. Indeed Lytvyn understands that he will be a junior partner among the others and that his opinion, will rarely be decisive. This does not correspond to the ambitions of Lytvyn, but he is ready for pragmatic collaboration if necessary." Yanukovych, in the opinion of the source, does not believe the promises of the head of state and leaders of BYuT and NUNS to create acceptable conditions for the opposition: "The doubts of premier are understandable - earlier there was no talk of such conditions, and thus far they do not exist. This is one of the themes of his personal negotiations with the President: the opposition must become a reliable tool of control from the first days of work of the 6th convocation of the VR." PoR spokesman Vasyl Kiselev refutes that there are different groups of influence in his party: Several of our leaders have made specific efforts to try and find common language with our opponents. Akhmetov and Bogatyryova went to see the President. But not once did Bohatyryovva go to see the President or Baloha without Yanukovych's knowledge." Seems that the main players are approaching the problem of forming a workable parliament in a mature and sensible manner. Whether anything comes of their efforts remains to be seen. p.s. In the meantime the law courts have to sort out challenges to the election results from the Socialists, the Communist party and from another minor party, before the results of the elections can be officially declared. It looks suspiciously as if all these legal submissions had a single source - the seriously creepy Serhiy Kivalov - one of the main orange revolution election fraudsters, now a PoR deputy. Check out this story from the recently much improved 'Kyiv Post' before it goes to subs. only. I've put it into my blog to illustrate again that there are no angels in Ukrainian politics. This story will 'have legs'..
On Monday evening BYuT and NUNS signed a declaration of intent to work together as a ruling coalition in the VR, having gained 228 seats. Their relationship has to be formalized at the first session of the new, sixth convocation, of the VR. The Central Election Commission has completed its tasks on time, but the date of this first plenary session of parliament has not yet been determined by a special preparatory group comprising representatives from each fraction entering the new VR. The group sets the agenda for that day, as well as the appointing a temporary presidium, sorting out the seating arrangements etc. According to the most optimistic forecasts this session will not take place earlier than the last few days of this month. Much can change in that time. "Regionaly" could regroup, and try a new tack in order to avoid going into opposition. Or the newly-formed democratic coalition could fall out over cabinet seats or other details. According to Taras Chornovil, one of PoR's 'mouthpieces', Regiony may even be prepared to sacrifice Yanukovych and force him to 'fall on his microphone' in exchange for a broad coalition. Lytvyn's bloc, which gained 20 seats in the new VR, will not even discuss who they will support for PM until a majority coalition is formally assembled in the new VR. If this coalition has an orange hue, then their bloc will consider this question at that time, said one of Lytvyn's boys. A former British PM once said, "A week is a long time in politics." 'Segodnya' speculates PoR may block the functioning of the new VR, preventing any voting on cabinet posts. They are particularly annoyed the oranges will attempt to reverse the law on the Cabinet of Ministers that reduced presidential powers, which BYuT had supported earlier this year. And if Yushchenko has second thoughts on a Tymoshenko premiership at any time, he has only has to whisper in the ear of a few NU deputies to press the 'Against' button..
Last weekend a statue of Ukrainian nationalist leader Stepan Bandera was unveiled in Lviv. 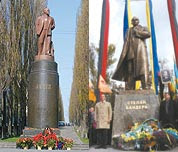 Rather embarrassingly, some observers say the statue resembles those of Lenin, erected in many Ukrainian cities in the latter half of the last century. There are particularly close similarities to the one constructed in the typical social realism style, that still stands in downtown Kyiv [see photo]. The Lviv newspaper 'Vysokyi Zamok' points out the similar postures - arm on lapel, coat caught in the breeze, the purposeful revolutionary stride with left foot forward..Oh dear..
LEvko says Bandera was not politician or a public figure, rather the head of an underground national liberation organization. Does the statue portray this? Tonight, in the offices of the presidential secretariat, the leaders of BYuT and NUNS signed a statement on their intent to form a coalition in the newly elected VR. "So the working format of [BYuT-NUNS] coalition has been revealed. But Volodymyr Lytvyn's silence is causing the potential partners to be nervous. Several times during recent days they have made clear hints [that they would like him on board too] but Lytvyn has persistently failed to react. Without him, their [BYuT-NUNS] coalition appears very risky - the absence of just three deputies means they cannot carry a motion in the VR. And if Yuriy Yekhanurov, or any other three deputies refuse to vote for Tymoshenko's premiership - everything will collapse. So the process of negotiation has entered a new phase - more intense and quick. That the President did not invite representatives PoR and CPU to today's encounter shows what kind of coalition he wants to see. But no one knows what the result will be." BYuT-NUNS have gained 228 seats in the 450 seat parliament. Lytvyn's bloc gained 20 seats. PoR and Communists together gained 202 seats. Without Lytvyn the wheels will drop off very quickly..Maybe that's why PoR are playing it cool too..
BYuT and NUNS have not yet submitted their coalition agreement to the president, but should do so Monday or Tuesday. Whether the Orange BYuT-NUNS coalition will garner 226+ votes required in the newly-assembled VR is a different matter. However, is seems they have now managed to 'divvy up' the ministers chairs and 'spheres of responsibility'. The proposals will make grim reading to many. BYuT will get the economic and fuel and energy portfolios, whilst the 'sylovyky' organs have been 'bagsied' [called dibs] by Yushchenko and NUNS. At the moment Lytvyn and his boys seem to be out of the equation entirely, but it looks as if the vice PM responsible for fuel and energy may be Vitaliy Hayduk, a wise choice. By retaining control of the 'sylovyky' Yushchenko can be sure no one will be 'sniffing around' suspect deals involving him and his closest circle, or deals he may have made with the Kuchmistas during the orange revolution. The primary reason for Yushchenko sacking PM Tymoshenko in September 2005 was SBU head Oleksandr Turchynov's investigations into RosUkrEnergo and its links to the president's closest confidantes. Turchynov is probably Tymoshenko closest partner. A reminder of what this was about here. I also recommend an article by Tetyana Chornovil [in Ukr] from 'Obozrevatel' about Viktor Pinchuk, former president Kuchma's son in law, and his 115 hectare estate - a former rehab and convalescence complex which was acquired by the most dubious of methods. He has even managed to wangle a no-fly zone over it, something even the president does not have over his 'pile'. The no-fly zone also covers Pinchuk's neigbours the Klyuyevs, and the Kolomoyskis. After the O.R. when Tymoshenko was PM, she and Minister of the Interior at that time Yuriy Lutsenko tried to get to the bottom of how this estate came into Pinchuk's hands, but failed, probably because the alleged immunity granted to Kuchma by Yushchenko also covered his close family. Pinchuk, one of Ukraine's richest men, has now morphed into global philantropist, in the words of the song "friend of stars, presidents and the pope in Rome." More on the great man from his own foundation site here . His family tie up with Kuchma does not merit a mention - obviously completely insignificant in the growth of his business empire. Tatyana Chornovil, who during her investigations was seriously 'leant on' and threatened by Pinchuk's security goons, ends her article: "Interestingly, when on the second day after the elections Yushchenko made his baffling declaration on the necessity of creating a broad coalition, there were boisterous celebrations at Pinchuk's estate. On that day nearly all political leaders were disorientated, angry and troubled, but at the Pinchuk's and Kuchma's there were salutes. On 8th October the president met the leaders of the parties that will enter the new parliament and gave them five days to sort out a coalition, submit a candidate for prime minister, and a program of action for the future KabMin. Public negotiations between NUNS and BYuT (and behind-the-scenes negotiations between NUNS and PoR) are far from complete. The main stumbling block is no one wants to give up the PM's chair, or satisfy the president's increasing appetite - he now wants to assign the minister of the interior too. BYuT and NUNS keep saying they have almost completed their arrangements...but not quite. Sticking points seem to be program details, including changing laws on the KabMin. For Yushchenko these laws presents a significant danger because they considerably truncate his authority and increase the authority of potential premier Tymoshenko. 'GpoK' claims the president's reaction to this week's brief standoff with Gazprom/Kremlin on the $2Bn 'gas debt' has been half-hearted, and suggests an explanation for this. There has been little reaction from President Yushchenko to the signing by Minister of Fuel and Energy (and future PoR deputy) Yuriy Boyko of a mysterious agreement on the liquidation of the "gas debt". He may not have even seen details of the agreement. Today Yushchenko sent Yanukovych a letter criticizing the projected budget for 2008, but did not point out Minister of Finance Mykola Azarov's increases in benefits for deputies and high ranking state officials. The reasons for the president's attitude may be that it just wouldn't look right for him to criticize the Party of Regions whilst behind-the-scenes negotiations with them are taking place, and then possibly even going into coalition with the same people shortly afterwards. Gas - a peculiar business..
Last week Gazprom publicly warned Ukraine that it would cut gas supplies to the country if Ukraine failed to pay its $1.3 billion debt in October 2007 and also notified its European partners of the problem. Ukraine’s Deputy Fuel and Energy Minister Vadim Chuprun noted that the debt in question was a debt owed to Gazprom by corporations, and not by the Ukrainian government at all. This was followed by a National Security and Defense Council of Ukraine spokesman claiming they did not understand what debt Gazprom was talking about. “There should be no debts based on the current scheme of agreements and contractual relations,” said Yuri Prodan, Deputy Secretary of the NSDC. And yet, as FT reported today, following Yanukovych's visit to Moscow, agreement has been reached and Ukraine will repay Gazprom in cash and gas after all. According to the FT, Russian prime minister Viktor Zubkov claimed the debt had risen by early October to $2bn, although RosEkrEnergo, monopoly supplier of gas to Ukraine, reckons its overdue debt to Gazprom is only $929m. Yanukovych was quoted as saying cryptically : “It [the debt] doesn’t exist as such but we have created a mechanism that will allow us to settle the issue,” in response to Zubkov. EDM has made an excellent attempt to explain of what is going on, but these huge discrepancies and the almost instant agreement are baffling, to say the least. Now today Fuel and Energy Minister Yuriy Boyko declared that the Ukrainian debt of $1.3bn was all "provoked by the Ukrainian opposition", and explained that according to the latest agreement 4bn cubic metres of gas in underground storage facilities will be sold to UkrGazEnergo at a previous price, as part of the settlement. This gas was earmarked for re-export to Europe and should not be used on the internal market of Ukraine. The surplus arose as a result of an abnormally warm winter when demand to Europe was low, he added. LEvko thinks if this 4bn cubic metres was unused stock from last winter, then it either belongs to the supplier or the end user, but not to the transit country - Ukraine. Because Ukraine's imported gas comes from just one supplier, the intermediary company RosUkrEnergo at a a price of about half of what other European customers pay, it is contractually not permitted to re-export gas. Yushchenko today called together the leaders of the parties entering the newly elected VR and told them they have five days to cobble together a workable ruling coalition. Previous experience suggests the chances of success are slim. Fault lines have predicably developed in NUNS, and 10-15 NU deputies may refuse to vote for Tymoshenko in her attempt to become PM again - she will need almost every one of those vote to be elected. In an article to be published in a German periodical Yushchenko, again asserts that the representatives PoR must be appointed to government posts "from vice- premier to minister". He obviously envisages formation of a wide coalition, or 'shyrka', something that has already been ruled out by BYuT and many NUNS deputies. PoR are not all 'singing from the same hymn sheet' either. Viktor Yanukovych considers coalition negotiations undertaken last week with prospective coalition partners by senior PoR figures Rayisa Bohatyryova and Boris Kolesnikov to be premature, and he sees only himself in the PM's chair. He says negotiations on the creation of a parliamentary coalition should only begin only after the official announcement of the elections results. Curiously, Yanukovych noted that PoR is not frightened of the possibility of working in opposition. "If this happens, the we will be in opposition," he said. At least the attempts to 'square the circle' are thus far, being conducted in a civilized manner. Today Tymoshenko and Yanukovych even had a brief conversation. A couple of days ago 40 out of 72 newly-elected NU-NS VR deputies signed an appeal to president Yushchenko declaring that they refuse to support any PoR-NUNS coalition in parliament. All the deputies from the National Self-defence quota in the NUNS bloc who will be entering parliament, have signed the appeal [apart from Oleksandr Omelchenko]. 'Dzerkalo Tyzhnya' also carry this item in a rather inflated article on possible coalition combinations. If the negotiations between PoR and NUNS on the creation of wide coalition are not successful, then 151 deputies from the PoR will not accept their mandates, giving a basis to acknowledge the Supreme Rada illegitimate. Our sources in the highest ranks of PoR report that the party is considering the option to refuse to take up 151 VR mandates unless agreement is reached on a wide coalition. "Even if we take up our mandates, but agreements are infringed and NUNS and BYUT create a coalition, then 10-15 patriots will always be found who will not vote for Tymoshenko as premier. In this case our fundamental position is that Viktor Yanukovych must remain premier," said our source." There you have it - clear and to the point..
p.s. 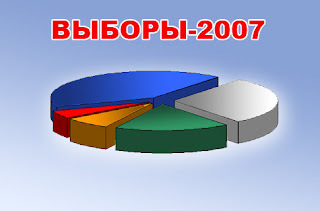 You wouldn't guess from this pie chart from 'Segodya' that BYuT [white] came within about 3.5% of catching PoR [blue] in last Sunday's election would you? An article in Akhmetov's big-selling 'Segodnya' newspaper reveals Lytvyn has wasted no time, and is already punching over his weight. Lytvyn envisages himself speaker of parliament, and sees members of his bloc in the positions of head of the state tax administration of Ukraine, and as Kyiv city head. Reliable sources have revealed that Lytvyn made these demands during private consultations with the leaders of the political forces which passed into the new parliament. A list was apparently produced during his encounter with the President, and then at his meeting with Yulia Tymoshenko. Similar demands were made by Lytyvn to the Party of Regions. Furthermore, Lytvyn's packet of portfolio requirements included retention of his brother Mykola Lytvyn in his position as head of the state customs service. All the main political forces consider Lytvyn's demands to be excessive - his bloc did not even gain 4% of votes cast. However, Lytvyn himself is not back-tracking." Segodnya claims the deal on the PoR-NUNS-Lytvyn bloc 'shyrka' [broad coalition] may almost be complete - with Viktor Baloha, currently head of the pres's secretariat, becoming PM. In this way Yanuk and Yulka are both neutralized in the race for the presidency. But the paper does go on to describe many possible twists and turns including splits in NUNS, and possible conflicts in any BYuT-NUNS coalition. The paper also reveals that 'lyubi dity': Yushchenko's nephew Yaroslav, Lutsenko's brother Serhiy, and son of former mayor of Kyiv Aleksandr Omelchenko all failed to enter the new VR on the NUNS list. You can be sure that Yanik's son got in though. By "commissiong the Party of Regions, BYuT, Our Ukraine-People’s Self-Defense and the other winners to start preliminary political consultations to form a majority in Ukraine’s parliament and form a government," the pres. today revealed he favours a grand coalition - there are already unconfirmed reports of behind-the-scenes meetings between head of pres.s secretariat Viktor Baloha, PoR fraction honcho Boris Kolesnikov, and Voldymyr Lytvyn. Tymoshenko is demanding clarification on this, but Pres. has gone to Germany at this critical time [to bestow an award to the Queen of Sweden?! - fixing up next summer's holiday?]. BYuT have again today reiterated [for the umpteeth time] that they would rather go into oppostion than join a coalition which includes PoR. In theory BYuT and NUNS could create a ruling VR coalition on their own, but with only 228 deputies in a 450 seat VR, it would most likely crumble in weeks. The Lytvyn bloc, with 20 deputies of their own, could join them, but closer examination reveals this bloc to be a most peculiar construct indeed. Their well-financed election campaign was generously supported by Vasyl Khmelnytskiy, Ukraine's 12th richest oligarch. He had been a BYuT deputy in the previous VR, but was one of the first to 'jump ship' and collaborate with PoR in the spring, when orange deputies started drifting over to the ruling anti-crisis coalition. He now appears on the new PoR list, but many of 'his people' will enter the new VR on the Lytvyn bloc list. I have posted previously about Lytvyn and the people with whom he tried to enter the VR in last March's elections, and others have also posted on his dubious past. Recent history strongly suggests such a BYuT-NUNS-Lytvyn coalition would not be stable, even if formed. As for PoR, going into opposition now would be too great a humiliation. They will simply refuse to pick up their newly-gained parliamentary mandates - the new VR would be still-born, and the current Yanukovych cabinet would continue to function. A few moments ago, in Berlin, Yush emphasized that some positions in the government and parliament must be given to the opposition. Sadly, some pro-orange commentators have gotten rather over-excited in recent days. LEvko thinks Yanuk could possibly be sacrificed to assuage orange anguish if a broad coalition is formed. Whatever the composition of any new ruling VR coalition and government, it will be an improvement on the previous PoR-Communist-Socialist anti-crisis coalition. If BYuT go into opposition, because have gained over 150 seats in the new VR, they have the power to 'bring down the roof' at a time of their choosing. However, a cheering feature revealed in the voting results, is highlighted in a 'Kyiv Weekly' article : the distant regions of Ukraine have it seems have drawn closer together - the threat of a split has receeded somewhat. In the north-west oblasts of Rivne and Lutsk, PoR scored a respectable 10% and 7%,. BYuT did well in the eastern and southern oblasts. NUNS scored 9% in Crimea, BYuT 16% in the Kharkiv oblast. The results show that the number of core regions, in which individual parties dominated in the 2006 elections, i.e. exceeded their score by 50% compared with the entire country, has been reduced by one quarter. So the scare stories of 'Banderites' in the east, and 'bandits' in the west are not having the same impact as previously. Parties, maybe for the first time since indepence, are becoming national parties, not just regional parties. As one slippery operator moves out, another one - Volodymyr Lytvyn - moves in. More on him from a previous blog here. As I wrote then, being in opposition is not his style. My hunch is that he will string his suitors along for a while, then probably go orange..but if this happens, there is no way PoR will stand in the opposition corner, and the toys will really start flying in the PoR nursery. A poll of exit polls show the Socialists gaining 2.5% of votes cast, which would give them precisely zero deputies in the new VR. Assuming that around 20 million Ukrainians in total voted, if about 100,000 votes for the Socialists could be "found" from somewhere right now, this would give the Socialists 3% of the votes and, bingo! 14 or 15 seats in the new VR, which could significantly tilt the result in PoR's favour. There are 450 seats in the VR, so each deputy normally is equivalent to 20 million divided by 450 voters, i.e. about 44 thousand voters. But for parties bubbling just below the 3% threshold, a few thousand votes could be very, very valuable. Update: Both President Yushchenko, in an official statement [in English here] and the Central Election Commission have warned electoral commissions, particularly in southern and eastern oblasts, to make haste and complete their counting of votes. The clear hint is that there may be malevolent intent behind the delay. He added that any falsifications will be dealt with by law enforcement agencies. Hmm.. There is chance that the Socialists may just creep in by a gnat's **** too, so, tension increasing..